As the weather turns cooler, I feel an even bigger urge than usual to turn on the stove/oven, cook heartier meals, and then gather around the table with family and friends to enjoy it leisurely. This past weekend, we had a lovely family meal here with my sister and her family. I deemed it "pasta night" because I like to pick a loose theme for our dinner gatherings. It's fun and makes the menu-planning flow a little easier. Pasta always hits the spot and feeds everyone's hunger properly. I decided on a simple menu of Italian cold cuts, pasta bolognese, and garlic bread for dinner. Yes, there was dessert but I'll save that for another day. As I was planning this dinner, I decided it was a great opportunity for me to sing the praises of this bolognese recipe that I've been making in the last couple of years. It's Ina Garten's "weeknight" bolognese. It's aptly named because while we enjoyed it over the weekend, it is easy enough to cook on a weeknight because it's ready to eat in just about half an hour! And the result...is magically delicious! This bolognese is meaty and robust, packed with flavor from red wine, crushed tomatoes, oregano, and a hint of nutmeg. I have Marie at little kitchie to thank for discovering this recipe because she posted about it a couple of years back on her site. Sadly (for me), Marie hasn't been blogging for a while now and I sorely miss her but when I make this recipe, I think of her. And thank you Ina Garten because this bolognese rocks! It's straight-up delicious, and all the more so when you consider just how fast and easy it is to make! It's great for entertaining because it's hearty comfort food that resonates with almost everyone, and you can also make it ahead. In this case, I made the sauce the day before and simply heated it up before tossing it with pappardelle while the garlic bread baked in the oven. I often make a pot of this sauce, divide it up, and freeze a couple of portions for another time. It is just fabulous and always a hit with my family. 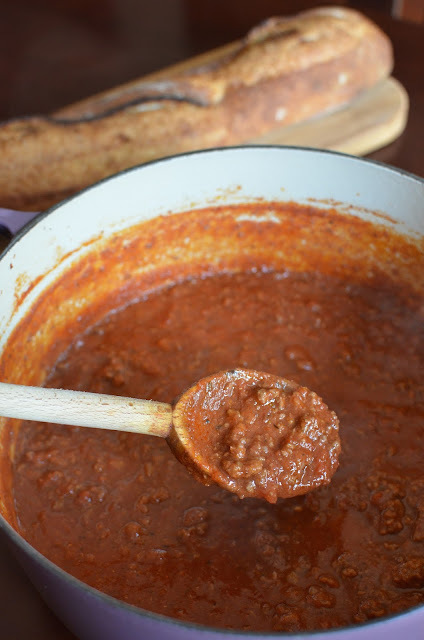 If a meaty bolognese appeals to you and you haven't tried this weeknight bolognese recipe from Ina, I highly recommend it. When I think of bolognese, I think of a meat sauce simmering away all Sunday and slow-cooking away on the stove so this quick weeknight bolognese is something of a magical trick in my mind. Cooking time from beginning to end is literally about 30 minutes. It starts with lean ground sirloin and somehow, the rest of the ingredients - the garlic, oregano, crushed tomatoes, tomato paste, plenty of red wine, and nutmeg - come together and combine to make this robust meat sauce in your pot. I follow what Marie did and finish the sauce with whole milk instead of cream. If I'm making it ahead, as I often do, I save the basil and parmesan cheese to stir in when I'm ready to serve. Ina suggests pairing the bolognese with orecchiette (pasta shaped like "little ears") and I've tried that. In fact, I've tried this sauce with many different pasta shapes but my favorite has to be pappardelle. It's perfect for any type of bolognese or ragu type sauce. And trusty Trader Joe's has a great egg pappardelle I love to use. You really can't go wrong with whatever type of pasta you go with. Just be sure to toss your pasta with the sauce and then ladle some extra sauce on top. I like to scoop up an extra bowl of sauce because we can never have too much and my son likes to plop some on top of his garlic bread. This is a very satisfying meal, particularly on a cold night, and we loved sharing it this past weekend with our family. What's better than good food with good company! Heat olive oil over medium-high heat in a large Dutch oven. Add ground sirloin and cook, crumbling the meat with a wooden spoon, for about 7 minutes, until meat starts to brown (at this point, you'll see the moisture has evaporated and the meat is starting to sear). Stir in the garlic, oregano, and red pepper flakes and cook for 1 minute. Add 1 cup of the red wine and stir, scraping up any browned bits at the bottom of the pan. Add tomatoes, tomato paste, 1 1/2 teaspoons salt, about 1 teaspoon of black pepper. Stir to combine. Bring mixture to a boil, then lower the heat and simmer for 10 minutes. Meanwhile, bring a large pot of water to a boil. Add 1 tablespoon of salt to the pot, then the pasta. Cook pasta until just al dente, according to instructions. While pasta cooks, finish the sauce. Add nutmeg, milk, basil, and remaining 1/4 cup of red wine, and simmer for another 8-10 minutes. Add cooked pasta and parmesan cheese into the sauce, tossing to combine. Serve hot, with extra parmesan cheese, if desired. * Make ahead: I like to make the sauce ahead or reserve some for another day. I finish the sauce without adding the basil or parmesan cheese. I stir those in when I re-heat the sauce when I'm ready to serve. To freeze, let sauce cool completely and place portions in a freezer bag. Lay bag(s) flat on a baking sheet in the freezer until solid. Once frozen, you can easily stack or store the bags upright in your freezer. I love Ina's recipes, and I can't believe I've never tried this one. Bookmarked to make it ... soon! You have got to try it! So good regardless of how long it takes and it really doesn't take long nor does it require a lot of ingredients. I am also a fan of Ina's recipes - it's easy to see why she is so popular. You did her proud with this lovely sauce! Love the pasta and the photos - what a fun way to enjoy friends and family! Have a great week! My husband is a huge fan of pasta with meat sauce. This is perfect for his lunch. I highly recommend it. It makes a lot and great to freeze some for later. Hi Monica, Ina's recipes are like gold, they always turn out perfectly. My daughter and her family would love this, looks delicious! Pasta is that one meal that I always keep going back to because of the simplicity of its nature and also because it's just plain delicious! This bolognese sauce is so cool! And that too in under 30 minutes? I have to try it! I can never believe how good it tastes and how short a time it takes to cook up! I have never tried any of Ina's recipes, but I would love to try some! This looks delicious! Hope you try soon! Thanks, Cathleen. Mama Mia! Bonjourno Monica. I love bolognese. A few years ago, I visited Bologna and learned how to make pasta and bolognese sauce and this is really bringing back some fond memories. The only difference is that you speak English. LOL My sweet little grandma chef only spoke Italian. Now I am craving pasta! I love bolognese and my son is absolutely crazy about it. I have been thinking for a while now to buy a book from Ina Garten. She is not very well known here, so I am not sure which book to choose. Can you recommend one? Hi Adina...Ina is something of a rock star here in the states. : ) Barefoot Contessa at home, back to basics, and foolproof are good ones to consider. Hope you try this recipe of hers. It's really good. In fact, I just made another pot this morning to freeze! Thank you, Monica, I will have a look on Amazon, see what I find. One, can we talk about how much I love that sign??? So fun! And two, this looks amazing! Definitely perfect for gatherings (and cozy weather!). Is that pappardelle from Trader Joes? I feel like it looks like one of their bags! haha I need to look next time I'm there! I have the same Dutch oven! Your bolognese sauce looks perfect! I have made it before but yours looks much more smooth than mine. Can't wait to make this! I love bolognese but am always put off by the cooking time (when I want food, I want it nooooooow!) so this quick weeknight bolognese definitely seems like a winner! We eat a lot of bolognese in our house, so I might just have this recipe Monica. Thanks for sharing! I don't think you'd regret it, Jo. Hope you try it...so easy and plenty of flavor!! Meant to say how great the photos are too! The last one is amazing 'with the steam'. Great job! That was sheerly unintentional... : ) I noticed it and thought it was neat (most of the time, I'm trying to blow the steam away so I can get a clear shot quickly). Thank you again, Jo! Ok, you can impress your brother thanks to Ina! It is really amazing and not more than 30 minutes to make. Please try it one day! I love making a huge batch of bolognese too then freeze them for quick dinners. This looks so simple, comforting and delicious! I've got 2 freezer bags of it tucked away right now. That makes me happy. Thanks, Jasline.